Why was AWC’s new antiscalant software named PROTON®? Protonation is the acceptance of acid protons from the surrounding solution, while deprotonation is the donation of acid protons to the surrounding solution. The name PROTON® was selected because all the calculations in the software, whether for scale saturation, or for salt rejection, are based on protonation and deprotonation of weak acids, bases and ion complexes in the Reverse Osmosis/Nanofiltration (RO/NF) process. How can PROTON® help me with system design? PROTON® allows the user to compare the required feed pressure and permeate water quality for various membranes under identical conditions. Once the design is selected, the user can simply select a different membrane type, and can instantly see the impact on pressure, water quality and scaling potential. The user can see real time impacts of changes in pH, temperature or recovery on pressure, flux and permeate quality. PROTON® accurately calculates boron rejection with varying pH, accounting for both temperature and ionic strength, and differentiating between rejection by nanofiltration, brackish, and seawater membranes. Other contaminant rejections that are calculated include iron, manganese, aluminum, ammonia, nitrate, nitrite, sulfides. It is also the only software currently available that predicts arsenic rejection with varying pH, temperature and ionic strength. PROTON® even provides calculations that help with design of pretreatment coagulation and post treatment degasification (see below: Chemical Speciation). What makes PROTON® different from other antiscalant software? Most reverse osmosis and nanofiltration antiscalant software assume 100% salt rejection. The few that allow entry of the membrane salt rejection apply it as a factor, completely ignoring the fact that salt passage is a function of membrane flux. PROTON® is the first antiscalant software that can design a nanofiltration or reverse osmosis system, and account for membrane properties and flux rates at the various stages of a system. 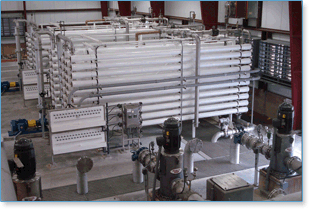 The user has the option of using the system design provided by PROTON®, or overwriting it with the membrane manufacturer’s array and flow rates per stage. The software also calculates the concentration polarization factor, providing the user with the most accurate, and optimum scale inhibitor dosages required for NF, RO or NF/RO hybrid systems. The hybridization feature allows the user to enter any combination of membranes within the same stage. PROTON® is also the only antiscalant projection software capable of modelling Desalitech’s Closed Circuit Reverse Osmosis (CCRO) technology. CCRO is a unique technology that uncouples recovery, flux and crossflow to enable operation at recoveries well beyond those achievable with conventional RO. PROTON® calculates the scaling potential for over 50 different scales that can form in RO/NF membrane systems. Many RO antiscalant software programs use “canned” formulas that fail or give erroneous readings outside a certain pH or TDS range. However, Proton’s scaling calculations are not based on formulas but rather on thermodynamic data acquired from peer reviewed scientific research papers. Temperature, ion activity, and ion complexes are considered for every single calculation. The software accounts for over 130 ion complexes, allowing accurate modelling for complex industrial wastewater reuse or seawater at the entire RO operating range of 1 – 11. The scaling saturations calculated by PROTON® are therefore the most accurate and reliable in the industry with all reactions tested in a controlled environment and reconciled in real world applications. Calcium Carbonate Nucleation Index (CCNI): The CCNI is a calcium carbonate index that accounts for pH, temperature, ionic activity, and ion complex formation. In reverse osmosis and nanofiltration systems, any amount of calcium carbonate scale will impact performance. The commonly used Langelier Saturation Index (LSI) is limited in that it does not account for ion complex formation, and only estimates ionic activity by applying a “fudge factor” based on TDS. At higher TDS, the Stiff & Davis index is often used, but is very unreliable when used for non-seawater applications. The Calcium Carbonate Precipitation Potential (CCPP) calculates the actual quantity of scale that can precipitate. But it is stoichiometrically limited, so that a higher driving force for scale formation can be masked by a low calcium concentration; a water with a high driving force for scale formation and a non-scaling water can both have a CCPP of only 125 mg/l simply because the calcium concentration is only 50 ppm in both. The CCNI is able to accurately predict spontaneous nucleation and saturation of calcium carbonate for any water quality in the pH range of 1 – 11 and temperature range of 5 – 60 °C. Malki Kinetics Index (MKI): This is an index based on the rate of formation for calcium carbonate that is used to calculate antiscalant dosages. In reverse osmosis and nanofiltration systems, even a very thin layer of calcium carbonate scale will impact performance. Most antiscalant projection software rely on the Langelier Saturation Index (LSI) or the Calcium Carbonate Precipitation Potential (CCPP) which quantify how much scale will form. That quantity of scale could form in seconds or over a period of several days, and this has made these two methods inadequate for reliably calculating the most optimal dosage of RO/NF antiscalant. The key is to determine whether formation is slow enough to be controllable by antiscalant, and if it is, then an exact dosage can be determined to redissolved crystal nuclei at a faster rate than they form. Antiscalant Precipitation Index (API): This index is the first of its kind in determining the limitations of various antiscalants in a membrane system. All scale inhibitors have the tendency to form calcium or magnesium scales. This applies to phosphonate, acrylate, and even “green” antiscalants. AWC® has also identified complex calcium-carbonate-antiscalant salts that form under certain conditions. The API calculates the solubility of antiscalants based on the amount of calcium in the water, alkalinity, pH, ionic strength, ion complexes, and temperature. It accounts for the different solubilities of different antiscalant salts, and accurately predicts whether a given dosage will result in antiscalant salt precipitation. Those who have been in the membrane industry long enough will recognize cases where scaling has occurred even when the calcium carbonate saturation was relatively low. This occurs because of precipitation of calcium-antiscalant salts; when the active inhibitor is lost, mineral scaling will form. The API allows the user to predict the likelihood of this type of scaling and accordingly make adjustments while still in the design phase. Malki Phosphate Index (MPI): This is the only calcium phosphate saturation index that accounts for pH, temperature, ion complexes and ionic strength. Because calcium phosphate has such low solubility, its saturation can be directly correlated to its rate of formation. The MPI accurately determines whether calcium phosphate scaling will occur, and allows for antiscalant selection and dosage calculation for its inhibition. Malki Silica Index (MSI): Silica formation can be slow enough so that a silica saturated solution may not precipitate until well after it has left the membrane system. The rate of formation is therefore essential in predicting how silica will impact the membrane system’s operation. Silica polymerizes into colloidal particles that grow and/or agglomerate to form silica scale. Certain cations such as calcium and magnesium can make silica less soluble and increase its rate of polymerization. Silica is more soluble at higher pH, but AWC® studies have shown that higher pH also increases the rate of polymerization at high ionic strength. Silica solubility increases at higher temperature, but paradoxically, its rate of polymerization is also faster with increasing temperature. The MSI accounts for all these competing mechanisms, and provides the most accurate prediction tool in the industry. Most antiscalant projection software calculate maximum recovery by assuming that a concentration of up to 300 ppm silica can be controlled by antiscalants; this overly simplistic approach is never reliable. By contrast, the MSI uses a highly sophisticated algorithm to account for all the thermodynamic and kinetic properties of silica so as to predict the behavior of silica in the system. The MSI can reliably estimate the amount of time that silica scaling will cause a 10 – 15% decline in permeability; this is extremely useful when performing cost analysis, allowing the designer to compare the cost of cleaning vs the cost of brine disposal while operating at a lower recovery. What is the Chemical Speciation function in PROTON®? PROTON® speciates weak acids, weak bases, metal hydroxides, and ion complexes based on pH, ionic strength, oxidation state, and temperature. This allows the user to determine the number of charges that the compounds will carry under any given set of conditions. This is essential for predicting both scale formation and front end membrane fouling by metal hydroxides. The speciation function also allows the user to see changes in the charges of any species with changes in temperature or pH in real time; a function that is extremely useful in optimizing pH for upstream coagulation. Finally, it allows the user to design for post treatment degasification based on carbon dioxide, ammonia, and/or hydrogen sulfide in the permeate. Why is PROTON® only available as a cloud based software? It can be accessible from any computer, tablet or smartphone that has an internet connection. Updates and improvements to the software can be performed seamlessly without the need for the user to download an update. Cloud based software can be constantly monitored for functionality, and eliminates issues associated with computer operating systems that are constantly changing from one year to the next. How can I be assured that information that I enter into PROTON® will remain confidential, and not violate any non-disclosure agreements I may have? PROTON® is based on a highly secure server with multiple layers of security. Furthermore, it does not allow any user to sign in without agreeing to the terms and conditions of use, which include a non-disclosure agreement (NDA) between the user and American Water Chemicals®, Inc. This NDA provides the user with assurance that American Water Chemicals® will be bound by confidentiality and will not share any of the user’s information without explicit permission from the user.